Can you think of a smell that triggers a fond memory or ignites a feeling? Outside our school and swirling around the West Loop neighborhood is the sweet smell of chocolate. The fragrance originates at the Blommer Chocolate Company and wafts daily through the nostrils of our children, families, and teachers. 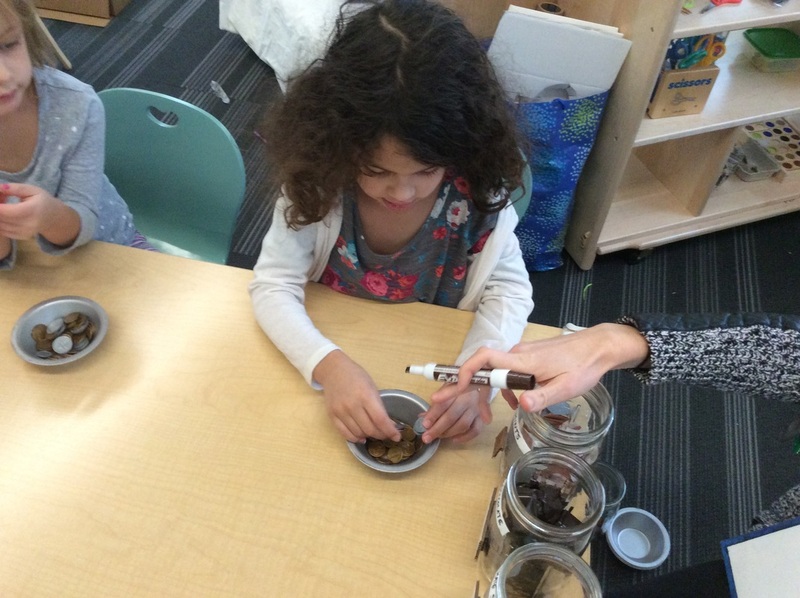 Maybe it was a day where the chocolate air was particularly pungent, maybe it was a teacher eating a piece of chocolate in school, maybe it was a little chocolate smudge left on a child's cheek from a morning donut, but whatever it was that ignited the curiosity set our classroom ablaze with interest in where chocolate comes from and how chocolate is made. 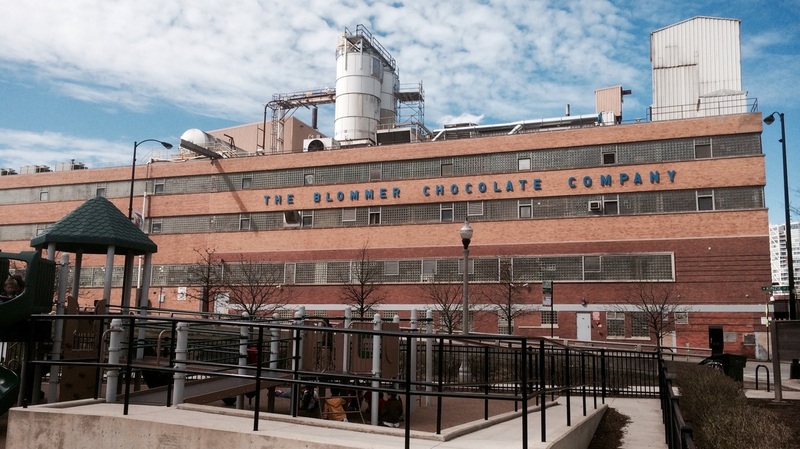 The Blommer Chocolate Company located just a couple blocks away from our school. You will notice the playground equipment of Fulton River Park in the foreground where our kids play. Some of the first "chocolate" made in the factory came from cardboard. The development of the factory has evolved into a more sophisticated space that uses many real ingredients. 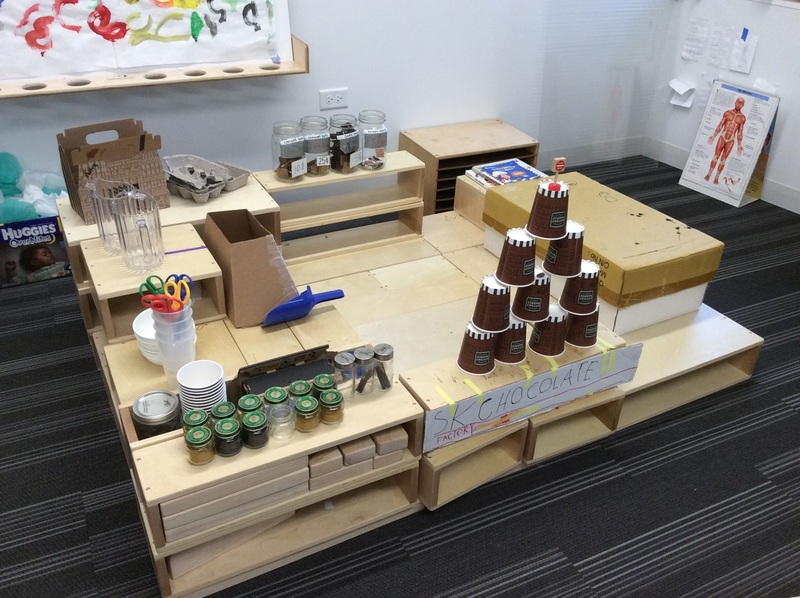 An interactive image of the SK Chocolate Factory. 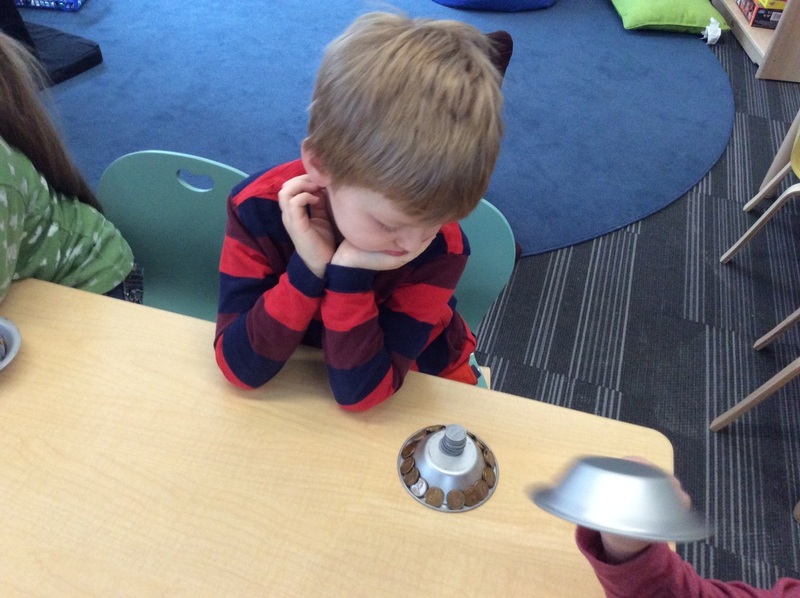 Hover over the image and click to hear student voices explain some parts. Have you ever tried building a factory? How about a chocolate factory? Now imagine being five or six years old and attempting such a feat. 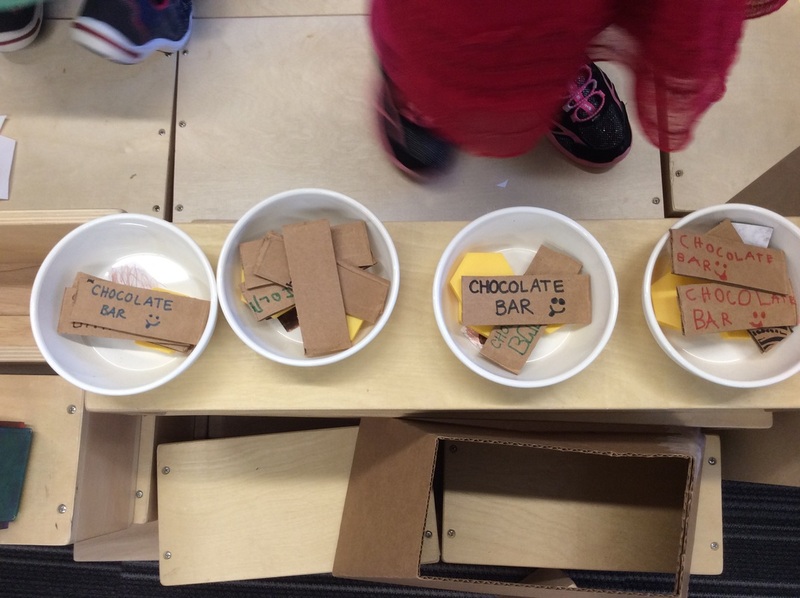 Even though the SK class has all the construction and chocolatier skills necessary to create a simple factory setup in our classroom, we wanted to learn more. 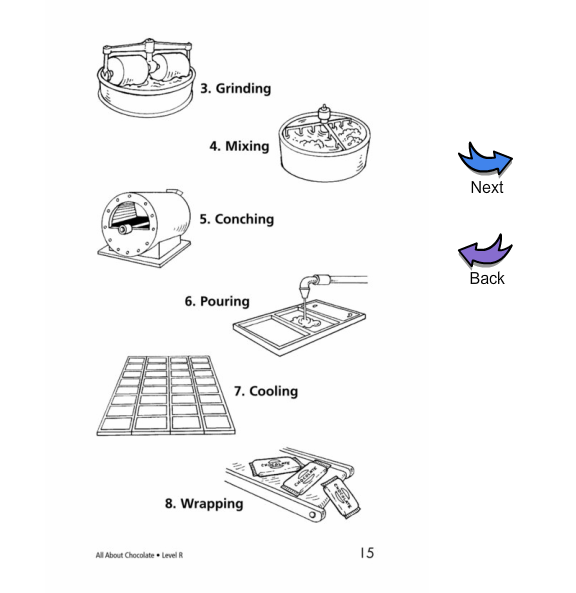 We wanted to know HOW chocolate went from a plant to the delicious treat we all love. What better way than to visit a chocolate factory. The natural thought was to check out the local Blommer Chocolate Factory but it turned out they didn't give tours (and weren't going to make an exception for us) so I had to keep searching. Call it chance but I ended up connecting with the owners of Vosges Haut Chocolate Factory in Chicago and they were more than willing to give us a tour. 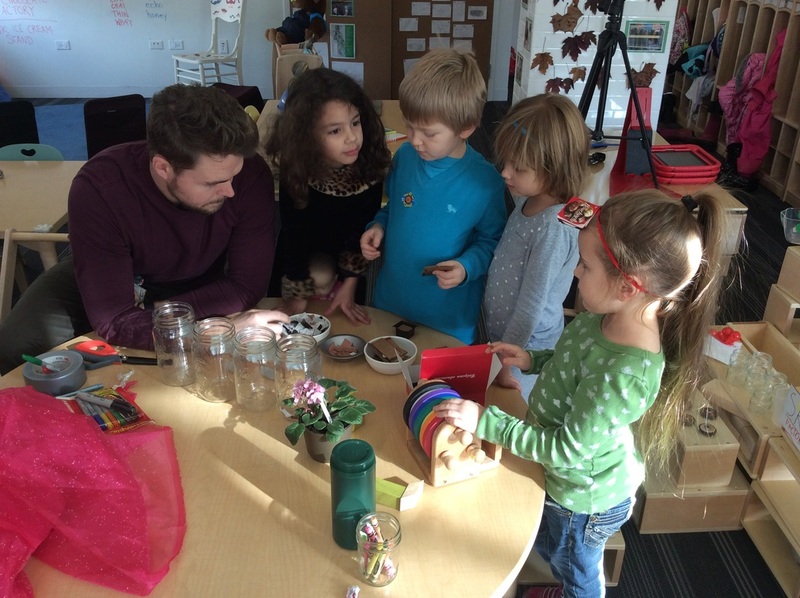 This unique opportunity was an incredibly powerful experience that inspired our already curious learners. 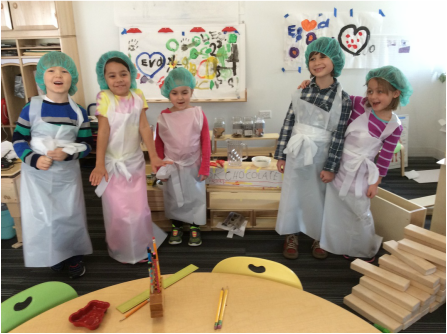 Upon returning from Vosges, our kids wanted to start wearing aprons and hair nets in their factory, just like the real factory workers. 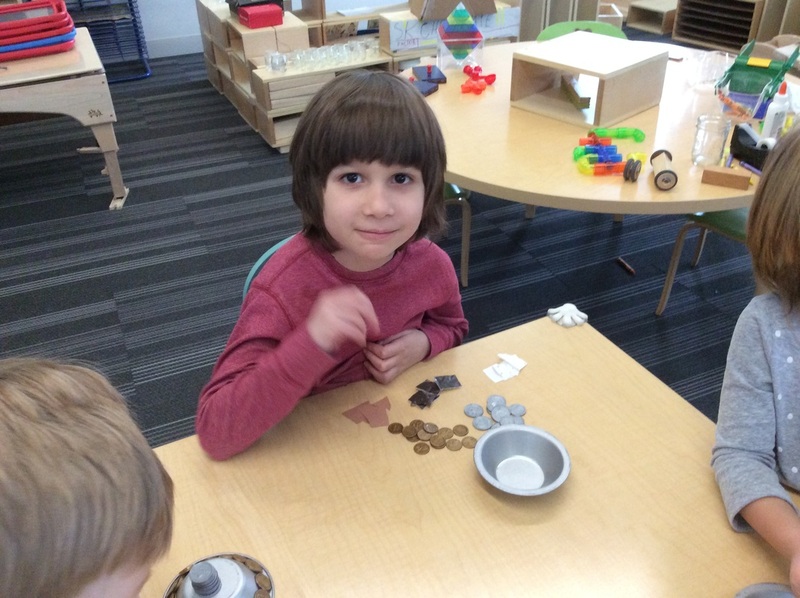 One of the easiest ways to incorporate math into the chocolate factory project was to introduce the concept of money. We've been practicing skip counting (counting by 2s, 5s, 10s, etc.) and so the concept of coin value was a natural way to skip count. Although still challenging at first, knowing that you can buy chocolate with coins is a powerful motivator! 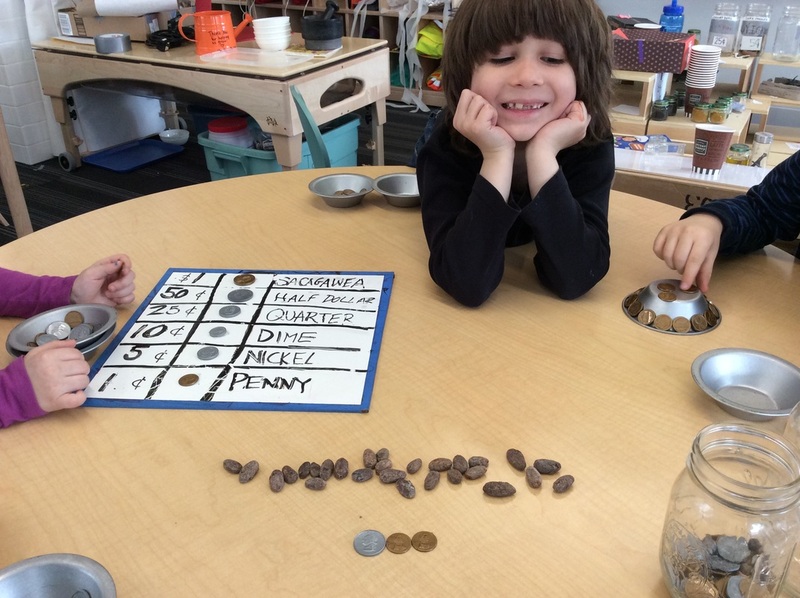 We played a number of exchange type games for children to relate coin values, make coin combinations, and by cocoa beans from the "banker". 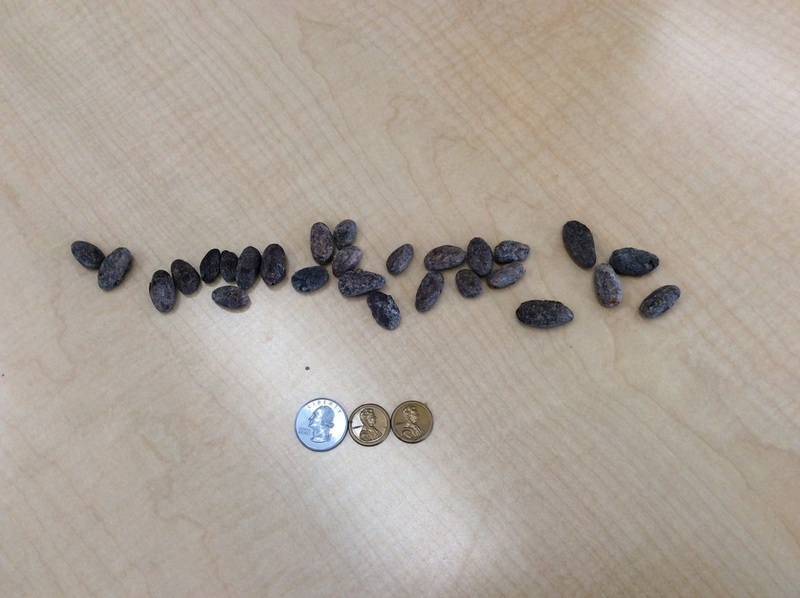 After much debate, the class decided to make each bean worth one cent. This seemed to make the most sense to them because in their words, "they are so small and have the same color as a penny." Jars labeled for coin names and values. 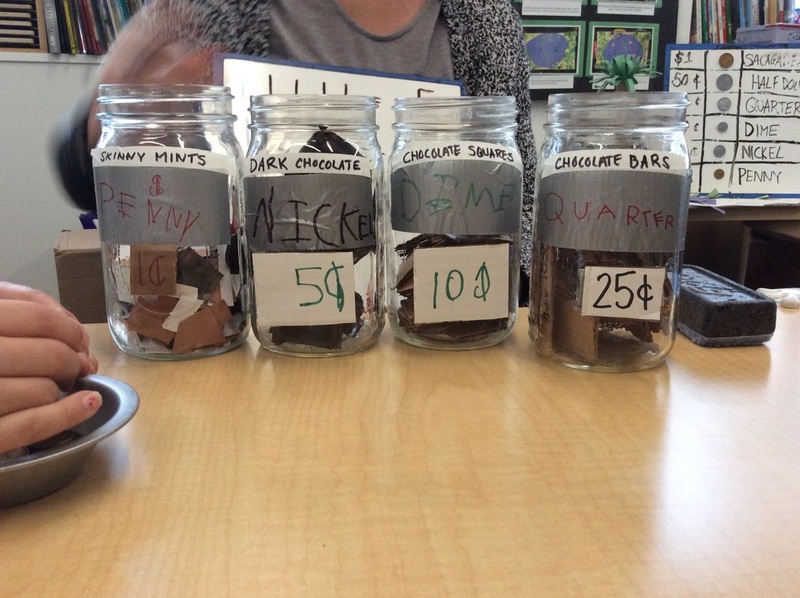 Inside each jar is a different kind of "chocolate" made from various classroom and found materials. If you look closely, you can see squares and rectangles cut from cardboard, paper, and plastic. 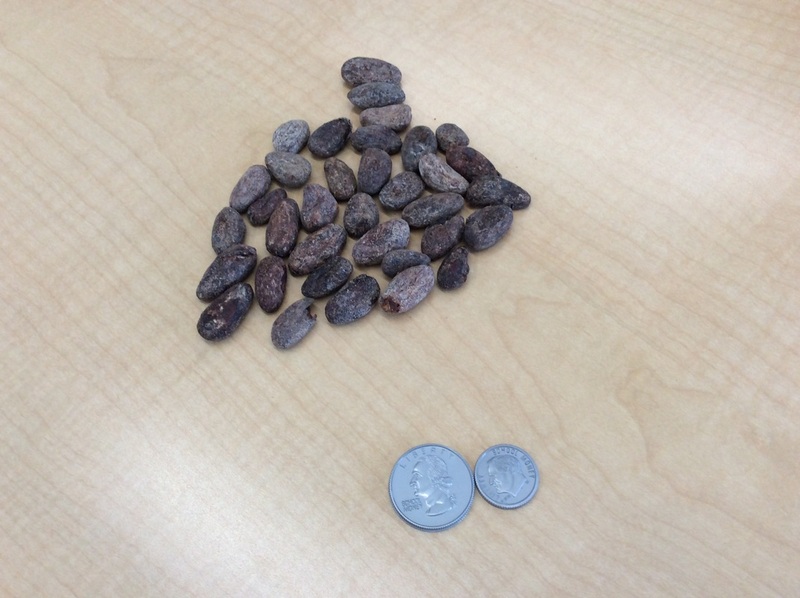 During our reading, we learned that the ancient Aztec civilizations used cacao beans as a form of currency. This idea was both confusing and inspiring at the same time. 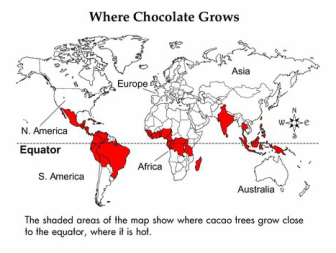 To think there was a time where money literally grew on trees made some of our kids want to plant cocoa plants in our classroom. That was a whole other path of inquiry taunting our minds. 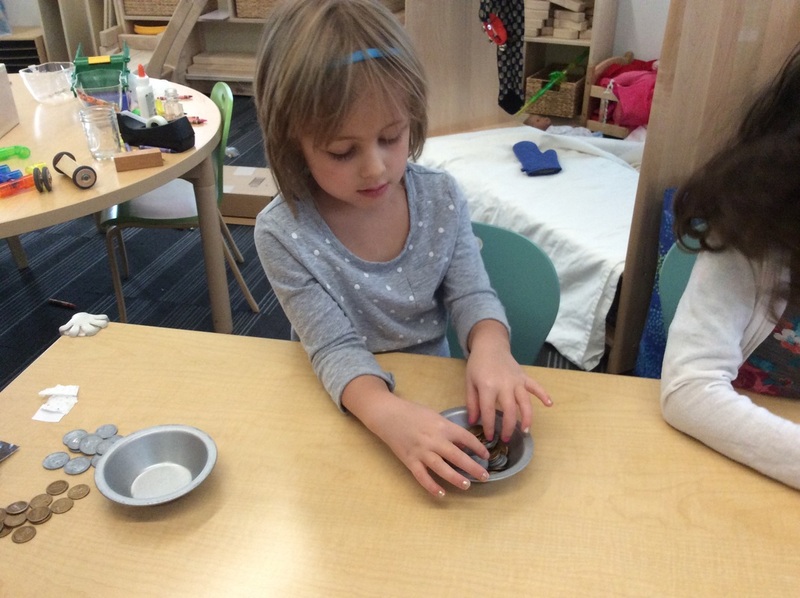 We instead regained our focus on the valuable beans we had in our classroom and began bartering and trading for various items in and around our classroom. Never have I seen such a frenzy of activity focused around cocoa beans that weren't yet in chocolate form. This might have been what those ancient civilizations were like on a daily basis. The writing process is slowly evolving in our classroom and with it comes the ability to put verbal reflections and memories onto paper. Learning to form letters and numbers in combinations to make words, sentences, and journal entries takes time and practice. At times, one of the biggest challenges can be finding meaningful topics and words to write about. When the reading or writing topic is directly connected to a classroom project, derived from student ideas and interest, the motivation factor is an asset, not a hinderance. Here are just a few samples of the reading and writing that has been involved in our research and reflection. 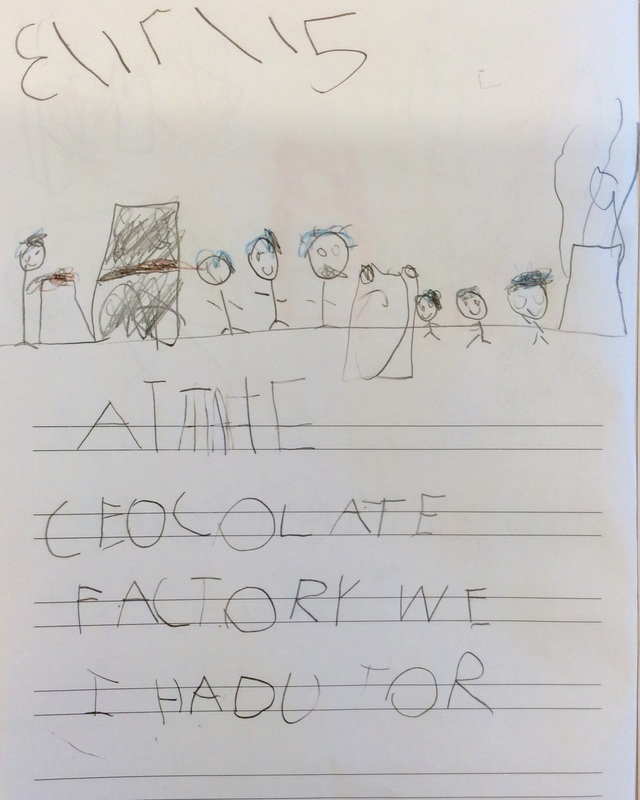 A journal entry from one of the children the day following our visit to Vosges chocolate factory. 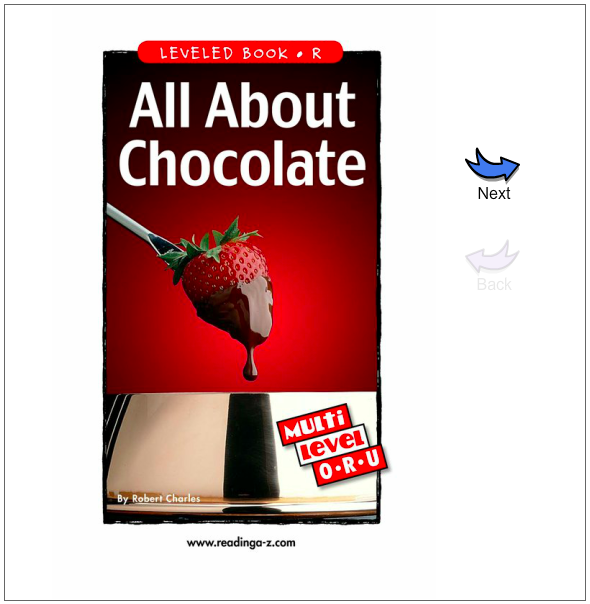 A screen shot of the cover of an ebook we read to learn more about our topic. The book is part of our class subscription to Raz-Kids.com online reading library. 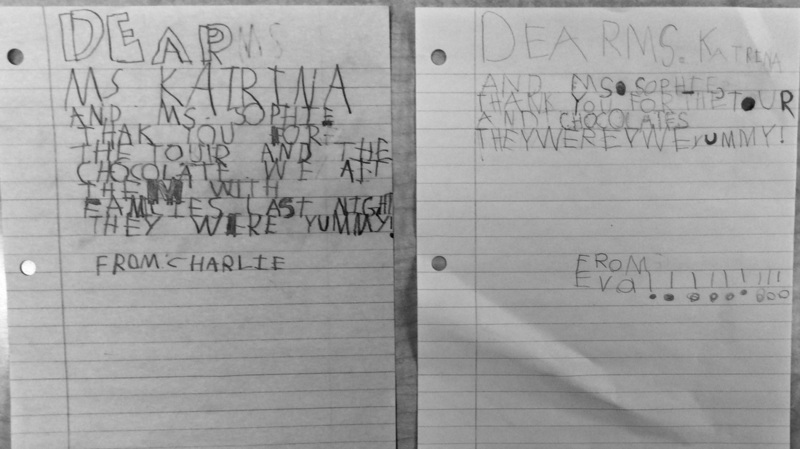 Two of the thank you letters we drafted together as a class. 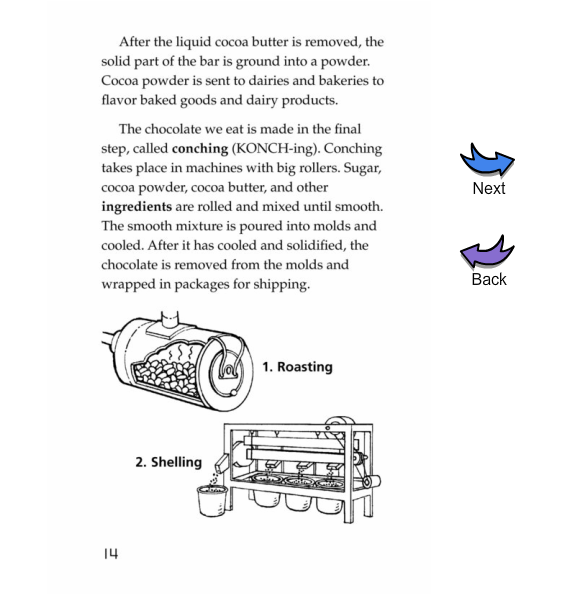 A few pages of our reading that outlined the chocolate making process and showed us where cocoa beans grow.